Calgary Coin offers an extensive selection of Canadian coins including large and small cents for sale on the internet and in my store here in Calgary. I usually have most dates available in a variety of grades and prices for collectors at all levels, usually priced at a discount from the Canadian Coin News trend sheet price guide. I normally do not provide images my coins as I have thousands of coins, sometimes multiples of the same coin. Imaging even a tiny percent of them would be impossible and putting that many images on my web pages would make them difficult to download, plus for inexpensive coins the value to the time to create the images would far exceed the value of the coins. I grade conservatively, describing any significant defects, including minor ones many dealers would not mention. If you ever receive a coin from me that you are not satisfied with, please feel free to return it for a full refund. Most people,including myself, commonly refer to these coins as pennies. They are actually 1 cent coins, using the American denomination of a cent and were intended to be equivalent to a British 1/2 penny. The young head Victorian coins struck in 1858 and 1859 are pre-Confederation coins for the British Colonial Province of Canada. These first two dates struck to a standard of 100 coins per pound of bronze rather than the British 1/2 pence standard of 80 coins to the pound of bronze. This made the coins unpopular and at first poorly accepted by a public used to the British Standards. The designs were by Leonard C. Wyon with the composition of the coins being 95% copper, 4% tin and 1% zinc weighing 4.54 grams at 25.4 mm (1 inch) diameter, with medal alignment. Although very rare, a few 1859's exist with coinage alignment due to a 180 degree die rotation error. There are also a few struck on incorrect brass blanks. The 1858 large cent is the rarest date of Canadian large cents although some varieties of other dates are rarer. There are several varieties in how the 9 appears on 1859 cents. The most common is a simple narrow 9 with all the digits at the same level, and a sub-variety where the 9 slightly lower than the other digits. Sone remaining 1858 dies were modified to 1859 by punching a 9 over the final 9 with the 8 still partly visible, resulting in the 9/8 variety. A number of 1859 dies have odd bits of extra medal around the 9 and are known as the "double punch" varieties, as discussion of which can be found in the Charlton standard catalogue of Canadian Coins. Canada became a country in 1867 but the large number of 1858 and 1859 cents in use satisfied the coinage requirements of early Canada for nearly 20 years. 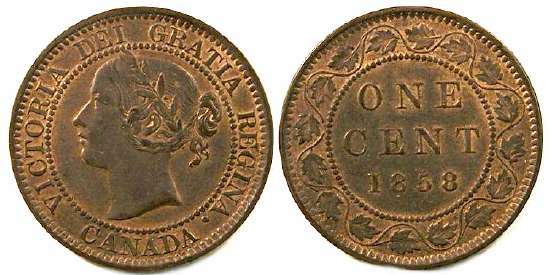 The first Dominion of Canada cents were issued in 1876 at the same 80 to a pound standard of the British 1/2 penny, making them acceptable to the general population. The designs are still by Leonard C. Wyon. The alloy remains 95% copper, 4% tin and 1% zinc. The diameter remains 25.4 mm (1 inch) but the weight increases to 5.67 grams. 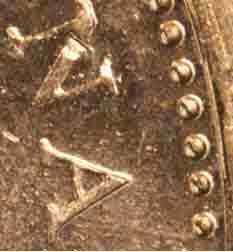 The die alignment is coinage alignment, unlike all other denomination that were medal alignment. Until 1907 all Canadian coins were struck in England at either the Royal Mint in London without a mint mark, or the Heaton mint at Birmingham with an H mint mark. The Heaton mint H is found below the date but above the ring of beads on all dates other than 1898 and 1900 when it is below the outer leaves nearly touching the rim. They all look alike at a glance but there four slightly different portraits of Queen Victoria are found on large cents, known as obverse 1, 2, 3 and 4. In 1876 and 1881 only obverse 1 was used. From 1882 to 1886 both obverse 1 and 2 were used. In 1887 and 1888 only obverse 2 was used. In 1890 all have obverse 3. In 1891 both obverse 2 and 3 were used. In 1892 obverse's 2, 3 and 4 were all used. From 1893 to 1901 only obverse 4 was used. A complete illustrated discussion of how to differentiate the obverse types can be found in any newer edition of the Charlton Standard Catalogue of Canadian Coins. There are a few small varieties for 1881, including obverse 1 and 1a, double punching of various letters, and some N's missing part of their serifs. For the most part I do not bother to sort these out. The major varieties in 1882 are obverse 1 and 2 which I do sort out. There are minor varieties of obverse 1/2 or 2/1 as well as some double punched lettering, but I make no attempt to sort those out. Obverse 1 and 2 occur in 1884, with obverse 1 much scarcer than obverse 2. Obverse 1 and 2 occur in 1886, with obverse 1 somewhat scarcer than obverse 2. Only obverse 2 occurs in 1887. All 1888 cents are obverse 2. Some 1888 cents are found with doubling on part of the date, with either one or two of the 8's doubled. Those with the middle 8 doubled are listed by Hans Zoell as RT9e. 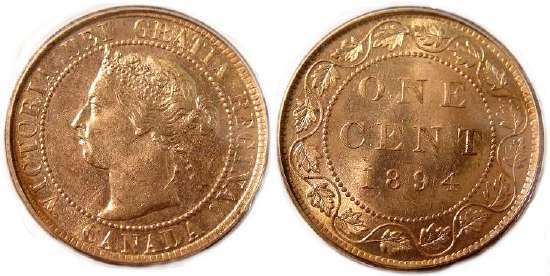 No Canadian 1 cent coins were minted in 1889. All 1890 are obverse 3. Depending on the reference you are using, they two sides of each designation can be reversed. For example, LDLL for Large Date with Large Leaves might be designated as LLLD for Large Leaves with Large Date. This is the only year where three difference obverse types occurs, obverse 2, 3 and 4. Obverse 2 is a little scarcer than obverse's 3 and 4. From 1893 to 1901 only obverse 4 was used, so I will not mention any obverse types for these dates. There is a scarce variety of the 1894 cent when the 4 is thicker and slightly larger than most examples. The thickness a better diagnostic so while some references call it large and others thick, I fell thick 4 describes it better. While there is only a minor price difference between the two, in my experience the thick for is much scarcer, possibly by 50 to 1. There are two varieties in 1896 with most of the coin a very evenly spaced date but on a few examples the 6 is farther from the 9 resulting in what is known as the FAR 6 variety. 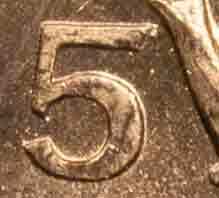 The easiest way to tell the difference is that on the regular variety the 6 is centered below the NT of CENTS, but on the Far 6 variety the right edge of the 6 is below the left edge of the T.
Normally coins wear equally on both sides but starting around 1897 and continuing for about 10 years, some large cents were struck with a concave reverse die resulting in a convex reverse which wears more quickly than the obverse. Such coins can be Fine or VF on the portrait but yet on the reverse the CE of CENTS is very weak or even worn through. There is no standard way to grade such coins so will split grade them, listing the obverse grade first and the reverse as G-4 or G-6 depending on how worn it is, and will price them accordingly. While not listed in the CCN trend sheet or the standard listings in the Charlton catalogue, the position of the H on the 1898 H 1 cent comes in two major varieties of a low and high H. On the high H the top left of the H will touch or slightly over lay the left above. On the low H the H will not touch the leaf at all. On looking at a group of 20 of these right now, there was a roughly even split between the two types so there is no difference in rarity or price and as this is a relatively unimportant variety I will not note this variety in my listings, but if you are specific about which you want when ordering, I will try to sort it out for you. The average quality in which we see the 1900 1 cents is much nicer than for earlier dates, which is reflected in the lower prices for higher grade examples. The results from it being the last year for Queen Victoria 1 cents which resulted in people putting them away to save them as the new Edward VII designs were introduced. To this day people still do this when a type is phased out, expecting them to one day become rare and valuable, but actually causing them to be the most common and least valuable in the series. We see this with the 1920 large cent, 1936 small cent, 1952 George V cent, and the 2012 final issue of the 1 cent. 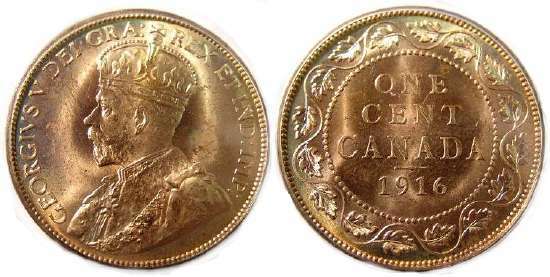 Prior to 1908, any Canadian coin which was not mint marked was struck at the Royal Mint in London, England, but starting in 1908 non-mint marked coins were struck in Canada at the Royal Canadian Mint in Ottawa. The 1907 coins with an "H" mint mark (below the leaves on the reverse, centered under the date) were struck at the Heaton mint in Birmingham, England. This Obverse type was designed by G. W. DeSalles, while the reverse continues the type designed by Leonard C. Wyon used since 1858. These were struck from an alloy containing 95% copper, 4% tin and 1% zinc. The standard weight was 5.67 grams with a diameter of 25.4 mm (1 inch). With a mintage of about 2 million, 1905 is the scarcest of the Edward VII large cent, although none of them can be considered rare. The Royal Canadian Mint opened in Ottawa in 1908 after which nearly all Canadian coins were minted in Canada. While the designs and alloy specification remain the same, there appears to be some type of change in the metallurgy. When they tone they are often a paler brown than earlier coins, and if cleaned have are more yellow-brown color. Often there are streaks of brighter yellow that do not tone as much as the rest of the coin, which if light does not affect things but when more dramatic I personally find somewhat unattractive (I will describe it when dramatic). I don't know enough about the alloys to say what changed, but I suspect there is an increase in the zinc content in some specimens (that could cause the more yellow color and different toning) and poorer quality mixing of the alloys than was done in England would explain the streaks. This Obverse type was designed by Sir E. B. MacKennal, and the reverse by W. H. J. Blakemore. These were struck from an alloy containing 95% copper, 4% tin and 1% zinc. The standard weight was 5.67 grams with a diameter of 25.4 mm (1 inch). All were struck at the Royal Canadian mint in Ottawa. George V coins were introduced in 1911 without "DEI GRATIA", Latin for "God's Grace", in the obverse inscription. 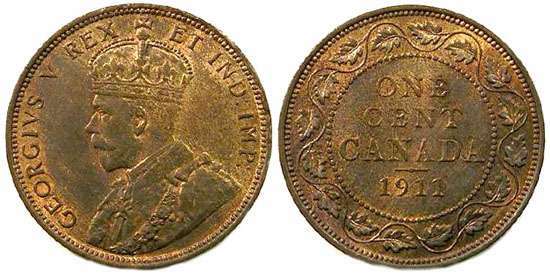 Known as the "GODLESS COINS" there was a public out rage or in 1912 "DEI GRATIA" returns to Canadian coins making the 1911's a one year type coin. With a mintage of about 3.4 million the 1914 is the scarcest date of George V large cents, although only by a little and only commands a premium in the higher grades. The 1911 in has a higher mintage but due to being a one year type is in higher demand than the 1914. 1920 was both the last year in which they struck large cents, and the first year in which small cents were struck. A considerable number of the 1920 large cents were melted for striking of 1920 small cents, but both large and small cents remain relatively common. To commemorate the Royal Canadian Mint's 90th anniversary, special sets of coins were struck with the sizes, alloys (other than the 1 cent), and general reverse designs of the 1908 coins but Queen Elizabeth's portrait and the date shown as "1908 - 2008". The one cent coins are the only large cents struck after 1920, and have the unusual feature of being copper plated silver, possible the only copper plated silver coins ever made by any mint. 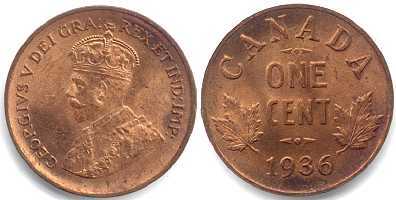 The early sets were struck with an antiqued matte-proof finish that proved unpopular with collectors, but an interesting variety on the one cent because the designer forgot to place the word "Canada" below the Queen's portrait, making these the only Canadian coin without "CANADA" anywhere on it. 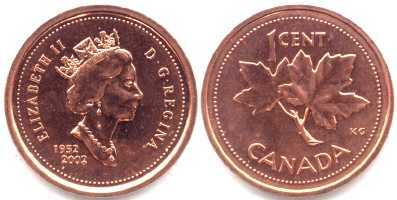 Sets struck later in the year were issued as mirror-proofs, but with "CANADA" added below the Queen's portrait on the one cent coins. In 1920, mostly to reduce the cost of coinage production, the government ceased to issue large cents at the standard of the British half penny, and began striking small cents of the same weight standard as the American cent. The obverse design is slightly different than that on the large cents and is by Sir E.B. MacKennal, whose initials B.M. appear on the truncation of the bust. The reverse design is a totally new by Fred Lewis. The alloy also changed slightly to 95.5% copper, 3% tin and 1.5% zinc. The standard weight is 3.24 grams, with a diameter of 19.05 mm (3/4 inch). With a mintage of about 1,2400,000 this is the third lowest mintage of small cents. With a mintage of just barely over 1 million, this is the lowest mintage date small cent, beating the 1923 by less than 20,000 coins. There are three major position varieties of the final 9 of 1929, low, middle and high 9's, although every die was probably slightly different and there were many dies. All standard references fail to discuss the middle 9 variety with the result that many people mistake middle 9 examples for high 9's. As both middle and low 9's are common, I only sort out high 9's on my listings. All four digits align at the top. The final 9 pointing below the 2. Both 9's higher than the 2, aligned at their tops. The final 9 points along the base of the 2.
it's bottom pointing at the base of the 2. 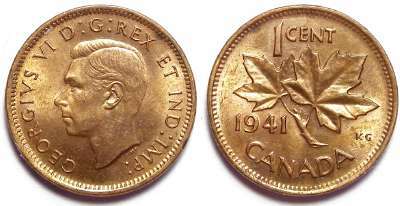 1937 saw a major change in Canadian coin designs, making them somewhat more artistic, and now each Canadian denomination had its own distinctive reverse designs (earlier coins were all variations on the same design). The obverse (common to all the denominations) was designed by T. H. Paget, whose initials H.P. appear on the truncation of the bust. The reverse Maple leaf design is totally new and by Kruger Gray, as indicated by the initials K.G. in the lower right field. From 1937 to partway through 1942 these coins were struck from an alloy containing 95.5% copper, 3% tin and 1.5% zinc (the same as the earlier small cents) but during 1942 the alloy was changed to 98% copper, 0.5% tin and 1.5% zinc. The standard weight is 3.24 grams, with a diameter of 19.05 mm (3/4 inch). All dates from 1937 to 1952 are common in average circulated condition. Because it is not economical for us to list coins under $1.00, some dates will not be listed here unless I have high-grade specimens available. 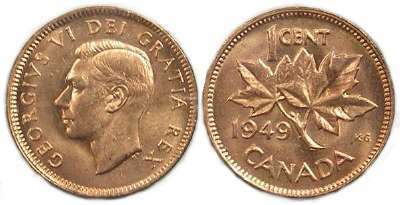 After 1936, there are no rare date Canadian 1 cent coins. While common as dates there are some scarce to rare varieties in 1949 (A to Denticle) and in 1954 and 1955 the no shoulder fold type. Average circulated examples of all dates (including common varieties of 1949, 1954 and 1955) are of too little value to warrant listing, although we should have them available in the store in pick bins. When India received its independence in 1947 "IND IMP" (India's Emperor) had to be removed from all British Commonwealth coins dated after 1947. 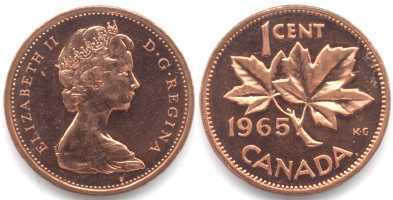 New designs were prepared in England and those for Canada were not ready at the beginning of 1948, so early in 1948 coins were struck dated 1947 but with a small maple leaf after the date indicating the coin was minted in 1948. 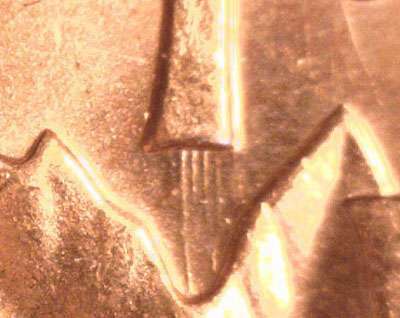 Pointed and blunt 7's based on the shape of the point of the 7 next to the maple twig occur on 1947 maple leaf cents. The blunt 7 is slightly scarcer than the pointed 7, but there is not much difference in value. When the new designs arrived in 1948 with "IND IMP" (India's Emperor) removed, the entire inscriptions now reads "GEORGIVS VI DEI GRATIA REX". This inscription was used until 1952. Both 1948 and 1949 cents are found with an obverse variety where the final A of "GRATIA" either between two denticles (known as either A between or A off denticle), or it can point directly at a denticle (known as A to or A at denticle). In 1948 both the A to and A off denticle varieties are relatively common and of equal value. These varieties refer to how the final of a GRATIA points at or between two denticles. For 1949 the A between denticles (also known as the A off denticles) is common while the A to denticle scarcer. The early 1953 dies had the shoulder fold weakly cut so that the shoulder fold was very week or not even present on most examples and the Queen's shoulder appeared bare. Known as the "no shoulder strap" (NSS) or "no shoulder fold" (NSF) variety these also have strong serifs at the top and bottom of the I's in II and DEI on the obverse. Later dies were cut with a deeper shoulder fold which usually strikes better resulting in the "shoulder strap" (SS) or "shoulder fold" (SF) variety, which has much smaller serifs at the top and bottom of those "I"'s on the obverse, and is the scarcer of the two types. Shoulder Fold examples worn to VF or lower may have the shoulder fold worn off and the only way to determine which variety is it by the looking to see if the I's are serifed or not. From 1954 to 1964 the obverse shoulder fold design was intended for all examples but some 1954 proof-like sets contain cents struck with a 1953 NSS die resulting a 1954 NSF variety. No 1954 circulation strikes were struck with this variety but some PL sets were broken up and spent so circulated examples have occasionally turned up (I have only ever seen one). In 1955 some circulation strikes were struck from a left over 1953 die, resulting in a 1955 NSS variety that is not found in mint sets. Fraudsters have been known polish the shoulder fold lines off regular examples, and some regular strikes are weakly struck so the shoulder fold does not show, but in both cases the I's will not be serifed so it is important to check that letter form to confirm these varieties. Note that 1954 cents in Proof-like quality will normally have slightly purple-red tone and are considered "red" that way. I am not sure why this tone only happens on this date. All 1955 circulation strikes were intended to be the shoulder fold variety but a left over 1953 NSF die was accidentally brought out and used in 1955, resulting in 1955 NSF examples. That die had been used became worn in 1953 so when reused in 1955 it produced coins with a weak obverse due to lack of detain remaining on the die. As a result one must look at both sides of a 1955 NSF cent and the grade will be based more on the reverse design which was struck with a fresh die. Some 1962 cents have considerable doubling on last three digits of the date with the ghost under date shifted up slightly from the main date. Known as the DOUBLE DATE variety, it is very similar to that seen on some 1962 5 cents, suggesting machine doubling where a problem with the minting press causes the die to bounce or rock during striking creating a slightly double strike with an off-set, where both the 1 and 5 cents with this feature struck on the same press. This variety was listed by Zoell as #D86p. 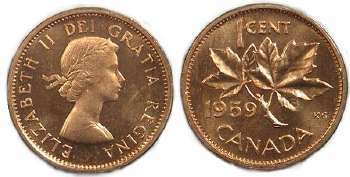 Some 1962 dies have vertical lines between the 1 of "1 CENT" and the notch in the maple leaf, probably die polish marks. Commonly known as the "HARP" but when the lines are stronger at the bottom it is also known as the "GUITAR" variety. While not listed in the standard catalogues Hans Zoell catalogues it as #K86c. A die clash caused the Queen's chin to be transferred to one reverse 1962 cent die, resulting in a faint line curling from the left maple leaf to the top of the 2, known as the "hanging 2" variety. A die clash caused the Queen's chin to be transferred to one reverse 1963 cent die, resulting in a faint line curling from the left maple leaf to the top of the 3 in what is known as the "hanging 3" variety. 1965 saw an updated more mature portrait of the Queen wearing a tiara, by Arnold Machin. The reverse design by Kruger-Gray was retained unchanged, as was the specifications of 3.24 grams, 19.05 mm, of 98% copper, 0.5% tin and 1.5% zinc. Many type 4 examples exhibit doubling of the INA in REGINA and the beads opposite REGINA, which is common and illustrated below. The doubling of the bead makes it look like a small bead over large bead, but it is the lower outline of the bead that defines the bead size, which is confirmed by the A pointing at that lower outline, while on the small bead the A points between two beads (slightly closer to the lower bead). The beads on a T-3 with large bead usually do not exhibit that doubling. In celebration of Canada's 100th anniversary of Confederation, all coins issued depicting an animal common to Canada, with a dove by Alex Covillie on the 1 cent. These were struck in huge numbers and are very common now, even in grades up to MS-63. Lesser one have very little value. Please note that up to 2011 when I describe a coin to be Proof-like (PL) I mean a coin from a mint set, intestinally struck to a higher quality than normal, but worth less than a MS (Mint State) coin from a bank roll in the same grade. They are fairly easily differentiated by their strike and luster. ICCS and some references call such coins "NON-CIRCULATING NUMISMATIC MINT STATE" which I feel will cause confusion in beginning collectors. Starting in 2012 the mint stopped making intentionally nicer coins for the standard sets and the coins are all simply MS (mint state) except for specimen and proof examples. Mint state (abbreviated MS) which are coins struck for issue through the banks and have average lustre and surface qualities. In most cases MS coins have little value unless in the highest range of the MS coins, and those are seldom seen. I don't list most dates in MS because they are not of high enough value to justify the time and trouble to list and/or ship them. 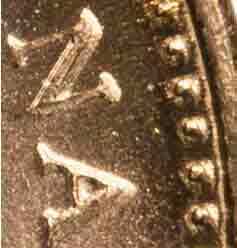 Proof-like (abbreviated PL) are standard mint set coins, usually from the pliofilm packaged sets, red double penny sets, and later the blue book set, but in later dates there were a variety of other types of sets they can come from. PL coins have a much higher lustre than MS coins, mostly because they are struck from dies in their newest die state. 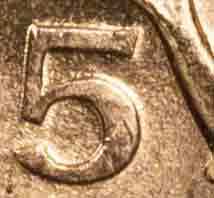 They also have very minimal marks (the average PL is a PL-64) as they did not go through as many of the mint handling processes as MS coins do, but they are not perfect coins and one should not expect them to be absolutely mark free. Specimen (abbreviated SP or SPEC) which were in the black leather double dollar sets from 1971 to 1980, and for later dates in various types sets. Like PL coins they are struck from dies in their freshest die state but differ in being double struck to give them a higher lustre and sharper images, and they do not go through any mint handling processes before going into the sets so are nearly mark free. The rims tend and edges tend to be a little sharper although this is not obvious on a casual inspection. When I list a coin as a specimen, it is because I personally took it from a specimen set before listing it here. Proof (abbreviated PR) coins are very nice coins found mostly issued in the double dollar black leather boxed proof sets starting in 1981, although some specialty coins did come other ways. The coins are clearly differing from the other striking qualities by being double struck from specially prepared dies so they have mirror fields and frosted images (and ultra cameo effect) and are specially handled so they go into the sets in near perfect condition as possible. Some 1979 cents show doubling on the date and occasionally other parts of the design. The degree and exact position of the doubling varies from coin to coin indicating this is machine doubling were the die is mounted slightly loose so sometimes bounces on striking. 1980 saw a change in the 1 cent coins that was largely unnoticed by the public. The designs and alloy remain the same but the weight was reduced from 3.24 grams to only 2.8 grams by reducing the diameter from 19.05 mm to 19.00 mm, and the thickness from about 1.5 mm to 1.38 mm. a 0.44 gram reduction in weight does no sound like much, but with a mintage of about 1 billion coins per year, the raw material savings to the mint was huge. 1981 saw the introduction of proof sets, with frosted images and mirror fields, in which quality 1 cents continued to be struck until 2012 when the issue of 1 cent coins came to an end. In 1982 the weigh was further reduced from 2.8 grams to only 2.5 grams and while the size actually increased from 19.00 mm to 19.1 mm, the shape was changed by making the previously round coins 12 sided which is equivalent to cutting off a small amount of metal at 12 points around the edge. While the alloys remain the same, there was a very minor design modification to the reverse where the denticle border was replaced by a beaded border. 1983 cent are found in two varieties with respect to the beads around the Queen's head. The far bead variety beads are slightly smaller and nearly 1/2 way between the rim and the tip of the Queen's bust. The near bead variety beads are only about 1/3 of the way between the rim and the bust. This can be difficult to determine unless you have the two side by side to compare. Both varieties are found in MS, Proof-like, Specimen and Proof quality. The CCN trend sheet and the Charlton Standard Catalogue list the far bead is more common in all striking qualities, but in my experience that is true for the MS examples but far beads is much scarcer in Proof-like, specimen and Proof quality. There are two varieties of 1985 cents. The very common blunt 5 is straight up and down on the top front of the 5 and can be found in all striking qualities. On the much scarcer pointed 5 variety the top of the 5 angles to the right pointing towards the maple leaf and is only occurs in circulation (MS) strikes. I seldom have a pointed 5 available and feel the catalogue values are probably too low for the type and so I list them at the catalogue values I do not discount them as I do most other coins. 1990 saw and update the Queen's portrait to a more mature style wearing a crown, designed by Dora de Pedery-Hunt. This issue caused some concern when many people noticed the Queen was wearing a King's crown rather than a Queen's crown, and people thought it was an error that would be recalled. That crown was designed for George IV around 1830 to be a comfortable light weight crown, and has been worn by every King and Queen (including Elizabeth) since then, and is the correct crown for the design of these coins. Kruger-Gray's maple leaf design remains on the reverse, as does the alloy of 98% copper, 0.5% tin and 1.5% zinc, with 12 sides at 19.1 mm and 2.5 grams. 1992 was Canada's 125th anniversary of confederation, and all 1 cents of this year have the date shown as the double date 1867-1992. Starting with 1996, on 1 cents with the proof-like strikes, the finish is different than in previous years. 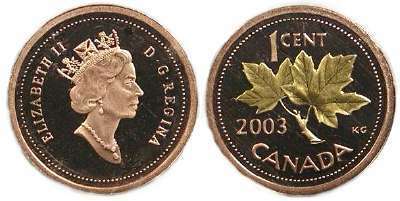 Instead of the overall high lustre finish over the entire coins, the 1996 cents have a matte finish with high lustre only on the portrait and maple leaves. The result is more like a reverse of the cameo proofs, although the degree of contrast is not consistent and some are slightly more dramatic than others. 1997 saw a major change in the cent coins. The basic designs remained the same with the mature crowned bust of the Queen by Dora de Pedery-Hunt, and reverse maple leaf design by Kruger-Gray, but the alloy was changed to pure zinc core plated with copper. The coins again become round (rather than 12 sided) and are 19.05 mm with the weight reduced to 2.25 grams. From 1997 to 2000 all 1 cent in MS, Proof-like and specimens striking are on the copper plated zinc core flans, but Proof coins continue to be struck on solid bronze flans. I recently examined a 1997 specimen set, and found no clear distinction between the Proof-like and specimen 1 cents as both had the matte backgrounds and higher lustre designs. In 1998, the Mint put a "W" mint mark below the Queen's head on coins minted at Winnipeg, although those were all in proof-like sets. Later in the years the minting of these sets was moved back to Ottawa where no mint mark was used. Thus proof-like 1 cents are found both with and without the "W" mint mark. All circulation (MS), specimen and proof coins were without mint mark. The finish on 1998 proof-like coins returns to high luster finish, while specimen coins retain the slightly matte finish fields with high lustre designs that first appeared in 1996. In 1999, the mint sets were all minted in Ottawa so do not have a mint mark. The proof-like coins all have the high lustre finish while the specimen coins have the vague reverse cameo finish. I have noted that a high percentage of 1999 proof-like cents have a surface with a lot of very small (nearly microscopic) bubbles, probably resulting from problems with the plating process while copper plating the coins with the zinc core. If ordering one of these in Proof-like striking you should expect it to have that feature. The Specimen strikes do not seem to have this problem, nor do the proof strikes while are solid bronze blanks so are not plated. In 1999, as a cost saving measure, the Canadian Mint made plans to strike 1, 5, 10, 25 and 50 cent coins on blanks that had steel cored that were nickel plated, then copper plated and then for all denominations other than the 1 cent, nickel plated again. A "P" was placed below the Queen's portrait indicating they are on plated steel blanks. 1999 "P" coins are test tokens to be sent to vending machine companies for calibrate purposes so their machines would accept the new coins as they came out over the next few years, and those companies were supposed to return them to the mint. Some ended up on the market at very high prices, so the mint got in on the action and sold about 20,000 sets of them to collectors at much lower prices. Packaged very similarly to Proof-like sets, their exact status is unclear and some including myself tends to call them Proof-likes, but others including ICCS calls them Mint State. Considering that at a mintage of only 20,000, they are almost as rare as a 1948 dollar, so remarkably inexpensive. Most 2000 coins in all striking qualities have nothing below the Queen's bust, a few very rare examples exist with the P and are accidental released test coins. Some of the PL and specimen coins come with the W for Winnipeg below the bust. PL coins have a high lustre even finish. Specimen coins have high lustre images with matte backgrounds. Starting in 2001, 1 cent coins come in three alloys. MS, Proof-like and specimens coins are found with a P (for plated) below the Queen's portrait if the flans are copper plated on steel, without the P if the flans are copper plated zinc, and all proof coins are on solid metal flans with nothing below the Queen's bust. Proof strikes can be on either bronze or pure copper flans depending on the year. 2002 cents are part of a special commemorative issue for the Queen's 50th anniversary, so the dates have been moved from the reverse to below the Queen's portrait on the obverse and they have used the double date "1952-2002" below the bust, to commemorate her 50th anniversary as Queen. 2003 is a slightly interesting year for Canadian coins, as it is the last year showing Queen Elizabeth with the old effigy crowned portrait, and the first year with the new effigy uncrowned portrait also known as the "Coronation Portrait". Introduced to celebrate the 50th anniversary of her coronation, it became the standard portrait on most coins after 2003. All old effigy 2003 1 cents have the P for plated, other than solid bronze Proof examples. New effigy circulation and proof-like examples have the P but some of the proof-like sets were struck at Winnipeg and have both the P and W together, the only time they occur together on any coins. No specimen or silver proof 10 cents were struck with the new effigy. There were two 2003 specialty cents. Some Proof examples struck on copper blanks have the double date 1953 2003 flanking a young head queen to commemoratie the 50th anniversary of her coronation. Other proof examples, on copper plated zinc blanks with gold plating on the maple leaves, are found only in the 2003 mint reports cover. 2004 and all later dates use the new effigy portrait. Circulation strike (MS) coins occur on both copper plated steel flans with the P below the Queen's head, and copper plated zinc flans without the P. Proof-like and specimen coins only exist with the P on plated steel blanks. Proof coins are on pure copper or bronze flans without the P. As in previous few years, Proof-like coins have an over all even lustre while specimen examples have high lustre designs with matte backgrounds. Proof strikes with gold plated leaves exist on copper plated zinc flans from mint report covers. 2005 circulation strike (MS) coins are found on copper plated steel flans with the P and copper plated zinc flans without the P. Proof coins are on pure copper flans. As with the previous few years, Proof-like coins have an over all even lustre while Specimen strikes have high lustre designs with matte backgrounds. Proof strikes with gold plated leaf also exist on copper plated zinc flans for the mint report covers. 2006 is the year the mint logo first appears Canadian 1 cents, but only later in 2006. Early 2006 use the P and non-P to indicate copper plated steel, and copper plated zinc flans. Later in 2006 and all following years have the mint logo (a stylized maple leaf in a circle) below the portrait and only way to tell them a part is with a magnet. As with previous years, Proof strikes are on non-plated blanks and do not have anything below the bust. With all the different P, no-P, and logo dies in use in 2006, errors occasionally occurred where P dies were used with non-magnetic flans and non-P non-logo dies were used with plated magnetic flans. When I have these errors I will include the word error in the descriptions. Beginning in 2007 all 1 cents have the Logo below the Queen's portrait, so I will no longer mention it in descriptions. Both Zinc (non-magnetic) and steel (magnetic) core blanks were used for circulation coins and can only be differentiated with a magnet. The non-magnetic ones were only about 1% of the mintage so are scarce. Proofs continue to be non-magnetic on solid copper or bronze. Specimen examples are all magnetic. Most proof-like examples are magnetic but some much scarcer non-magnetic examples are found with a matte finish in some of the hard pack mint sets. All 2008 circulation, proof-like and specimen examples are on magnetic steel core blanks. The only non-magnetic examples are the Proof's on solid copper or bronze blanks. In 2011 the mint stopped making intentionally superior quality coins for Proof-like (standard) mint sets, rather using normal MS coins that had not gone through all of the mint handling processes rolled coins go through. With is no way to differentiate between MS-63 or better coins from a set vs bank rolls, they should be priced the same with the prices reflecting how earlier dates from sets are priced. For 2011 and 2012, when available I will price the standard 1 cent types here at MS-63 @ $0.50. MS-64 @ $2.00. MS-65 @ $12.00. Specimen sets are still produced with frosted backgrounds and mirror designs and should be priced slightly higher than the PL listings. Both copper plated zinc non-magnetic and copper plated steel magnetic 1 cents were minted in 2011 for circulation and in standard mint sets and once removed from the roll or set cannot be differentiated so I price them the same price. The specimen and proof strikes have distinctive finishes and are scarcer so are priced higher. All Specimen strikes are on copper plated steel magnetic blanks. Proof strikes are on non-magnetic solid copper or bronze blanks. The characteristics and striking qualities are the same as for 2011. Please note that up to 2010 I describe coins as Proof-like (PL) when from a mint set. PL coins are easily differentiated by their superior strike and luster and although nicer than MS coins from bank rolls are generally worth less. ICCS and some references call these coins "NON-CIRCULATING NUMISMATIC MINT STATE" which I feel is confusing. Starting in 2011 the mint stopped making intentionally nicer coins for standard mint sets, instead using MS (mint state) coins which had not gone though some of the normal mint handling procedures that leave marks on MS coins. Specimen and proof sets still use specially struck coins, which have a very different finish.